Virteacon: Vietnam Police Rules - Say NO to Sunglasses, Chatting, Smoking, Drinking, Reading! Vietnam Police Rules - Say NO to Sunglasses, Chatting, Smoking, Drinking, Reading! 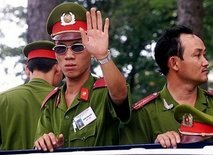 Vietnam Police is well known for their "widespread Police brutality", and recently Communist Vietnam has banned police from wearing black sunglasses, chatting, smoking and putting their hands in their pockets while they are on duty in public places, a media report said. Under a new order from the Ministry of Public Security, officers must also "keep appropriate manners and be in the right position when on duty," said the English-language website of state-controlled Tuoi Tre newspaper. The report, published on Saturday, also said on-duty police were now banned from reading books, making or answering non-work related phone calls, drinking alcohol or eating at restaurants that illegally encroach onto pavements. But will the Police ever follow such instructions? Certainly not in India, I wonder how it would be for such rules to be implemented in Kerala!